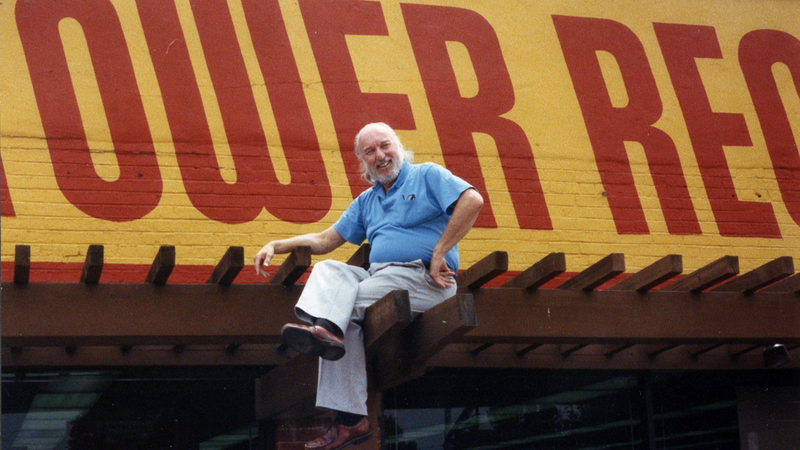 The Life And Death Of Tower Records, Revisited : The Record A new documentary from Colin Hanks looks back on a business empire that helped shape the tastes of many music fanatics. These days, virtually every type of music imaginable is at our fingertips nearly anytime, anywhere. But for decades, getting that kind of access meant trekking to an actual store, where the store buyers were tastemaking kings. Throughout much of the 1980s, and especially during the CD boom of the '90s, Tower Records locations across the U.S. were meccas for music fans. Actor Colin Hanks — Tom's son — loved Tower so much, he spent seven years making a documentary about the chain. It's a love letter to Tower Records called All Things Must Pass. In Hanks' documentary, you see founder Russ Solomon and his innermost circle — many of whom were there when Tower was founded in California — having a ball building this thing together. Everyone, from clerks to customers, could feel those good vibrations. During its flush years, Tower was a pilgrimage place for music fanatics — even for the world's biggest stars. Elton John talked to Hanks about how he'd go into one of the Los Angeles stores every week to buy stacks of new releases. "Tuesday mornings, I would be at Tower Records," John says in the film. "And it was a ritual, and it was a ritual I loved. I mean, Tower Records had everything. Those people knew their stuff. They were really on their ball. I mean, they just weren't employees that happened to work at a music store. They were devotees of music." Tower started out as an offshoot of Solomon's father's drugstore in Sacramento, Calif. He tells Hanks how he got his friends and relatives to help him get off the ground. "Luckily, my cousin Ross was a builder — electrical, carpentry," Solomon says in the documentary. "And so he volunteered, 'Oh, I'll go down and fix it up, put some lighting in there, put a new floor in, and paint it.' And that was it. He went in and did it." Solomon's California inner circle eventually became some of Tower's top brass, and that family atmosphere spread as the company expanded. Jason Sumney started out as a clerk at Tower's store at 4th and Broadway in New York before moving into its regional operations. Christman says that Tower wasn't alone in the hunger to expand that eventually proved to be its undoing. Tower's competitors weren't just other record stores. Big-box outlets like Wal-Mart, Target and Best Buy wanted music fans' dollars, too. But they discounted CD prices drastically to get customers through their doors, in hopes that they'd also pile things like clothes, pet food, batteries and TVs into their shopping baskets. "What they did was they looked at the basket — was the basket profitable?" Christman says. "So if there was a lot of other items in there, they didn't care if it was music or not. Whereas at the record store, Tower Records, they needed everything in the basket to be profitable." Tower couldn't afford to discount CDs much. And Tower couldn't persuade consumers to spend somewhere between $12 and $19 for an album. Solomon couldn't persuade the labels to lower their prices or start selling CD singles. You can hear that in a 1994 promotional video from Russ Solomon, in which Solomon says: "As for the whole concept of beaming something into one's home, that may come along someday, that's for sure. But it will come along over a long period of time, and we'll be able to deal with it and change our focus and change the way we do business. As far as your CD collection — and our CD inventory, for that matter — it's going to be around for a long, long time, believe me." Solomon and Tower had their critics, none of whom are in Hanks' documentary. In the 1990s, for example, Tower — along with other megachains like HMV and Virgin — was often accused of putting independent mom and pop music retailers out of business. But for Hanks, making this film was a chance to revisit a time and experience that molded him. "Tower was one of those places. It was special, it was unique," he says. "You forged a connection with it, whether you knew it or not. I didn't know it when I was a kid, and it wasn't until I started making this project that I realized just how informative it was for me when I was growing up. And it's like that for a lot of people." Even though it's been nearly a decade since Tower closed its doors, its memory still burns bright for fans whose musical tastes were shaped below those yellow-and-red signs.